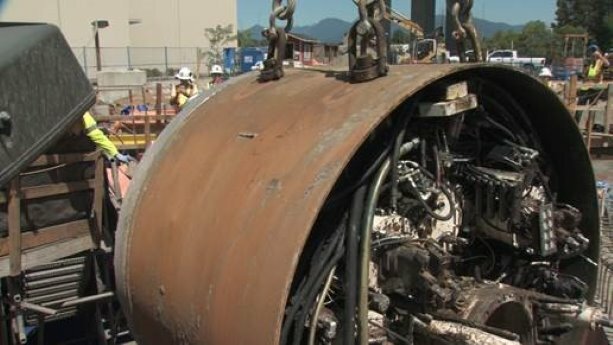 That was one of the challenges crews faced while tunnelling under the Fraser River for the Port Mann watermain, which wrapped up last month. The massive tunnel boring machine, named Squirrel, was removed from under the river on July 17. Crews will now spend the next six months laying pipe. 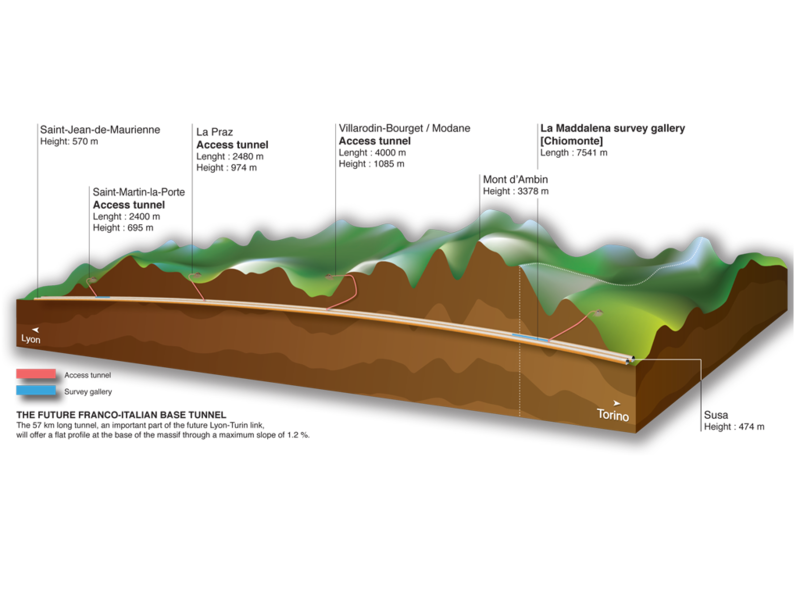 “The goal of this major infrastructure project is to construct a seismically resistant watermain that will not be damaged by river scour and will meet the needs of future growth in our region,” said Metro Vancouver chair Greg Moore. “This new watermain will replace the existing 40-year-old crossing, which was damaged by river scour. This tunnel construction is truly an amazing engineering feat,” he added. However, digging the tunnel was not an easy task. It involved sinking 60 metre shafts on both sides of the river and tunneling under high pressure from the water. Before any soil was removed, major projects director, Frank Huber, said a game plan was needed. Because of the complex challenges, the team decided to do request for proposals rather than tender. Additional points were awarded for methodology and expertise. It also allowed early negotiation with the front runner. “That put us in a position where we wouldn’t have to take the low bid, so to speak,” Huber said. A joint venture of McNally International and Aecon Constructors was award the project designed by Sandwell Engineering, Jacobs Associates and Golder Associates. The contract included a partnering process to build and maintain relationships between the project participants. Huber said the proper team selection and the good relationships were important when problems arose. Such was the case earlier this year when the tunnel boring machine became stuck after tunneling 800 metres with 200 metres to go. “We had to think of an innovative approach to access the machine and fix it under that six bar pressure,” Huber said. The team knew they could do a hyperbaric intervention, but it would be expensive and time consuming. “Collectively, we were able to come up with a solution that was effective in terms of price and time,” he said. It involved drilling a series of boreholes around the machine and pumping in liquid nitrogen to freeze the ground, allowing crews to access it. This prevented high pressure water from coming in during repairs. The tunnel is about 30 metres below the river bed and was constructed between two 60-metre-deep vertical shafts, in which the 80-metre-long tunnel boring machine was lowered in February 2014 and removed on July 17. The new Port Mann Water Supply Tunnel will more than double the capacity of the existing water main and help ensure continued reliable delivery of drinking water to the municipalities south of the Fraser River. The new main is also designed to withstand a major earthquake. Now that the tunnel is complete, a new 2.1-metre-diameter welded steel watermain will be installed in the tunnel and shafts. The 3.5-metre-diameter, one-kilometre-long tunnel housing the main crosses between Coquitlam’s Maquabeak Park on the north side of the river, and the CN Thornton Yard in Surrey on the south side. Construction on the Port Mann Water Supply Tunnel project began in 2011. It will connect to the existing water transmission system by means of two new valve chambers, located at the top of each shaft. Installation of the new watermain and construction of the south valve chamber will commence this summer, and the $240 million project is scheduled to be completed in fall 2016. 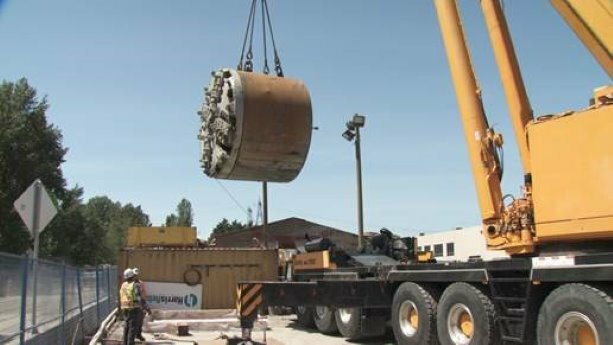 “This complex crossing of the Fraser River by a tunnel boring machine under very difficult ground conditions is a major technical achievement,” said Darrell Mussatto, chair of Metro Vancouver’s Utilities Committee.